Thank you for visiting another one of Sonia S Auto Sales's online listings! 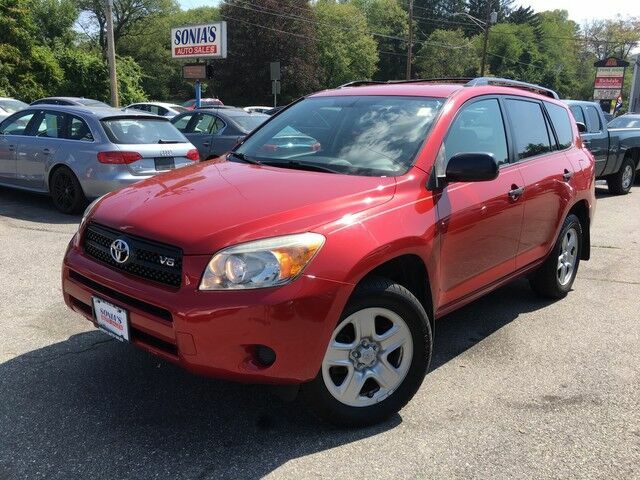 Please continue for more information on this 2007 Toyota RAV4 with 90,000mi. This Toyota RAV4 offers all the comforts of a well-optioned sedan with the utility you demand from an SUV. This Toyota RAV4 comes equipped with 4 wheel drive, which means no limitations as to how or where you can drive. Different terrains and varying weather conditions will have no effect as to how this vehicle performs. A Toyota with as few miles as this one is a rare find. This RAV4 was gently driven and it shows. High-performance tires are another option found on this vehicle. This Toyota RAV4 is in great condition both inside and out. No abnormal "wear and tear". More information about the 2007 Toyota RAV4: The 2007 Toyota RAV4 has a very roomy interior for a compact SUV and is one of the few models in its class to offer a versatile third row of seating. The V6 available on the RAV4 is the most powerful engine in its market segment, and it makes the RAV4 quicker than some performance-oriented premium SUVs. Both engines boast impressive fuel economy. This model sets itself apart with Roomy interior, available third-row seating, acceleration with V6, standard safety features.